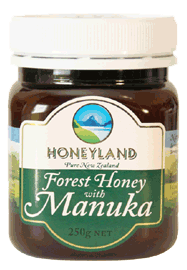 This Forest honey, which contains no less than 50% Manuka honey, is rich in taste. 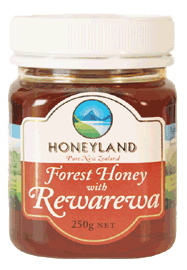 It features the complex flavour of wild New Zealand forest flowers, and the distinctive after-taste of honey from the tiny white flowers of the Manuka shrub. This is a honey to be enjoyed daily with the knowledge that it has special properties. This Forest honey, which contains no less than 50% Rewarewa honey, is warm in colour and flavour. It reflects the diversity of floral sources found in the rainforests of New Zealand and is characterised by a subtle red glow that comes from the red-tinged flowers of the majestic Rewarewa tree. 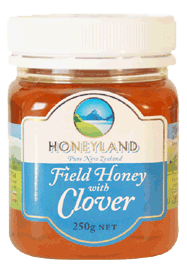 This Field honey, which contains no less than 50% Clover honey, is famous for its light colour and clean, delicate sweetness. This is the traditional honey of New Zealand, collected from New Zealand’s agricultural farmlands that are covered with pink and white Clover flowers in Summer.